Trump's Pick for National Security Adviser Advocates Tough Response to Russia - Integration Through Media ....! 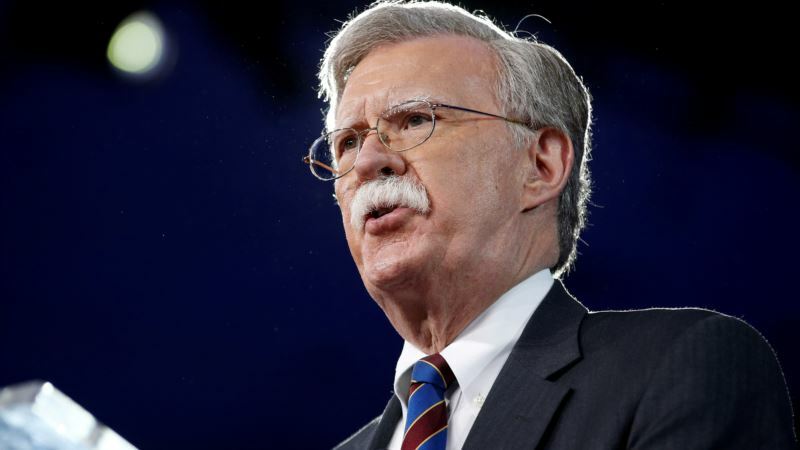 (VOA): President Donald Trump's pick to be his new national security adviser, John Bolton, is known for his "hawkish" views on North Korea and Iran, but also has pushed for a tougher U.S. response to Russian aggression in the West and around the world. Bolton has said the United States has been clear that it stands with its allies after the attack with Russian nerve gas on a former double agent and his daughter in Britain. Moscow denies responsibility for the poisoning. "I think you saw a statement by the four leaders of Germany, France, the U.K. and the United States. I think that is a pretty good indication that the four countries see this the same way," Bolton told a Sky News reporter last week, when asked if the U.S. and its allies should be tougher on Russia. And during a discussion in February, before he was chosen by Trump to be one of his top advisers, Bolton outlined how he thought the U.S. should respond to Russian meddling in the 2016 U.S. presidential elections. "Whether [the Russians] were trying to collude with the Trump campaign or the Clinton campaign, their interference is unacceptable. It's really an attack on the United States Constitution," Bolton said at the Daniel Morgan Graduate School of National Security in Washington. The former U.S. ambassador to the United Nations called for an "overwhelming" response to Moscow. "Whatever they did in the 2016 election, I think we should respond to in cyberspace and elsewhere," Bolton said. "I don't think the response should be proportionate. I think it should be very disproportionate. Because deterrence works when you convince your adversary that they will pay an enormous cost for imposing a cost on you." In an op-ed in the Daily Telegraph in July of last year, Bolton went even further, alleging that Russian President Vladimir Putin looked Trump in the eye and lied to him when he denied Russian government interference in the U.S. elections. "It is in fact a casus belli, a true act of war, and one Washington will never tolerate. For Trump, it should be a highly salutary lesson about the character of Russia's leadership to watch Putin lie to him," Bolton wrote. Putin has denied his government was behind the election attack, but has acknowledged individual Russians may have been involved. 'Russia's worst nightmare' For his part, Trump repeatedly has downplayed Russian interference in the U.S. elections, noting results of the vote "were not impacted or changed by the Russians." Trump also has repeatedly called the investigation by Special Counsel Robert Mueller into Russian election interference and possible coordination with the Trump campaign a "hoax" and a "witch-hunt." "Every time he [Putin] sees me, he says, 'I didn't do that.' And I believe — I really believe that when he tells me that, he means it," Trump told reporters last November when asked about Putin's denial that Russia was behind the cyberattacks. Former U.S. Ambassador to Russia Alexander Vershbow tells VOA that Putin may need to adjust his expectations of a friendly relationship with Trump now that Bolton is joining the team. "We now have John Bolton, who is very tough on Russia, coming into the White House next month, so hopefully Russia will draw some conclusions from this and look for ways to pursue a less confrontational policy with the West," said Vershbow, an Atlantic Council distinguished fellow. Harry Kazianis, with The Center for National Interest, agrees, saying Moscow should brace for changes from Washington. "I think John Bolton is Russia's worst nightmare. He has been a Russia hawk for all of his career, he has always advocated a tough stand on Moscow," Kazianis said. "I can see Bolton recommending to the president quite a few changes on policy, one being further arms sales to Ukraine." 'No reservations' Bolton does not need to be confirmed by the U.S. Senate and is set to begin working in the White House on April 9. At the Pentagon Tuesday, U.S. Defense Secretary Jim Mattis told reporters he had "no reservations" and "no concerns at all" about working with Bolton and any divergent world views. "I hope that there's some different world views. That's the normal thing you want unless you want groupthink," Mattis said. National Security Correspondent Jeff Seldin and VOA Russia Service contributed to this report.